Lawrence H. Shapiro is a partner with the Firm and Co-Chair of the Litigation Department. His practice is devoted to commercial litigation, eminent domain and municipal law. He received his B.S. from Pennsylvania State University in 1991, and his J.D. from The Dickinson School of Law in 1994. Mr. Shapiro is admitted to practice law in New Jersey, New York and Pennsylvania and is an adjunct Professor of Business Law at Monmouth University. Following his graduation from law school, Mr. Shapiro served as law clerk to the Honorable Ira E. Kreizman, J.S.C., retired. In 2013 Mr. Shapiro successfully argued before the New Jersey Supreme Court in Borough of Harvey Cedars v. Harvey Karan and Phyllis Karanthat the benefits conferred on a property owner from the state’s exercise of eminent domain needed to be considered in calculating the compensation the state provided for acquiring the property in a partial-taking condemnation. The Supreme Court’s decision in the case reversed a more-than-century-old precedent (Mangles v. Hudson County) and cleared the way for cost effective shore protection measures to be undertaken by the state and federal government. 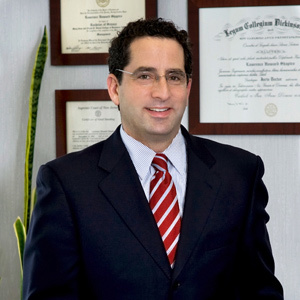 Mr. Shapiro is a member of the Monmouth County Bar Association and has served on the Unauthorized Practice of Law and Membership Committees. He is a member of the New Jersey State Bar Association and the District IX Ethics Committee. He is a lifelong resident of West Long Branch where he currently resides with his wife and two daughters. He is involved in coaching youth sports, is a past President of the Monmouth County Volunteer Center, a past Board Member of Family and Children’s Services of Monmouth County, a present member of the Board of Monmouth Park Charities and is on the executive board of his synagogue.